I can't empty the trash or almost. There are no buttons or context menus to empty the recycle bin. The only way I find strange is to move a favorite from the recycle bin again, into the recycle bin to delete it completely. If you right click on it, don't you see the option to empty the trash? Is this Developer? There is a known bug there, I'm afraid. You need to put the mouse over the trash can, are you doing it? I don't know why, the last update of opera has corrupted some files in config folder, I don't know where and what, so I decided to delete my config folder and relaunch opera. 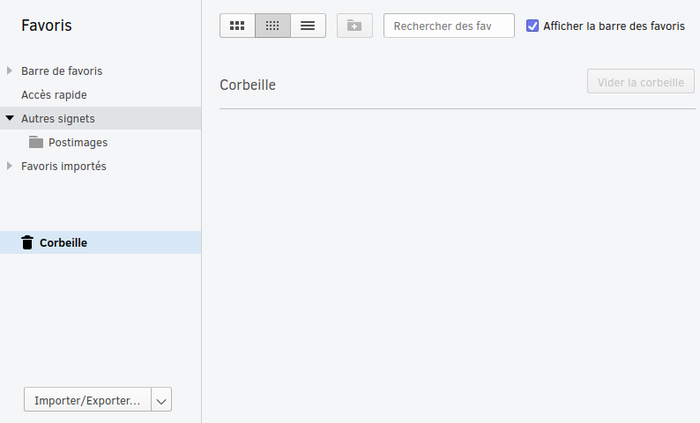 Now I don't have the strange behavior in the bookmarks manager anymore, everything looks normal and fonctionnal. I can now delete bookmarks and empty the trash with contextual menu as usual. Fortunately, sync saved my time and I restored my opera exactly as before, quickly. Sorry for the inconvenience and thank you for help.